oneTesla • View topic - oneTesla OCD! 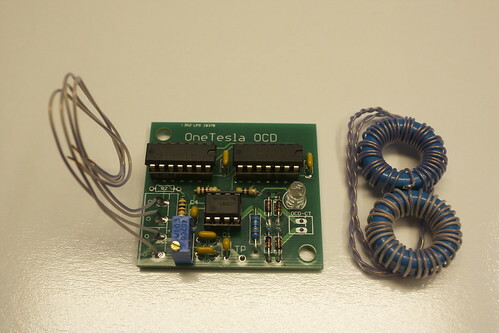 If anyone wants over current detection for their oneTesla coil, I've made a little PCB that does it. It connects using 4 wires (+5V, GND, Input, and Output) and a current transformer. To install it, you just need to desolder a resistor and solder the 4 wires from the board, and install the current transformer over the primary wire. If anyone is interested, they are $30+shipping. If you have any questions, feel free to ask! Hey Alex, good to see you're still at it! I've just fixed mine last weekend since the last failure months ago. Thinking that an OCD can really add some value, I'm definitely interested. I was wondering what would be included? Is it plug & play, do we have to solder it (kit form), is it the bare PCB and do we need to get our own components, or do we only have to get some components (gdt)? Seems like a really neat board though! 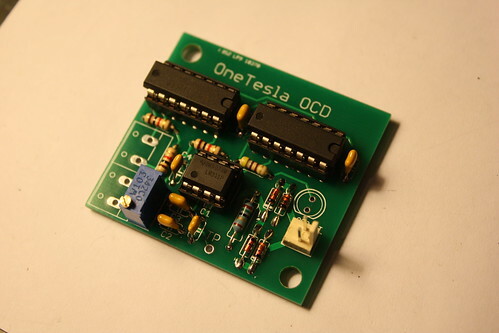 Take a look at my website for oneTesla compatible MIDI files. Enjoy. I'm currently selling them as assembled boards, and you'd get the PCB and a current transformer. You'd have to desolder a resistor from your board and solder four wires that connect to the OCD board. You'd also have to loop the primary wire through the current transformer, and solder that into the OCD board. I'm going to write up some more documentation soon. If you'd like, I suppose I could supply you with all of the parts and a schematic in kit form. I can't really sell just the boards bare because I have all of the parts for the boards already. Assembles boards are okay for me, just wanted to know what I was getting in to (whether or not I needed extra parts). Do you reckon it would enable performance like this: http://youtu.be/yFHq9exLbwk ? I've been scared to let mine make streamers to ground due to the increased current and the fact that I blew it up both times I ran it. I can't 100% guarantee it, but it will definitely help protect your coil depending on what you set the OCD at. I've been able to draw some arcs from it with a shovel. The IGBT's are more likely to die from overheating than over current. You can see the OCD kicking in when the red LED turns on. I suspect that your coil is out of tune, but this board can also show you how much primary current you're running. Any estimate how much it'd be outside the US (the Netherlands)? i'm very interested in your ocd's. Do you still have them?